Good book. Enjoyed reading it. Maybe a little farfetched in some areas but made it interesting. Excellent book for a book club. Shows the strenght of women. Lilly and Bob my favorites. Well-paced, western story not encumbered by traditional romanticized notions found in the genre. Able to provide a realistic glimpse into life during a particular interest period of US history while keeping things relatively light and entertaining. 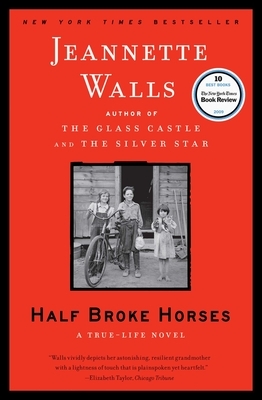 If you've read The Glass Castle by Waller, you'll find Half Broke Horses is a more cheerful book. Having lived in the Mid-West for many years, I appreciate the pioneer spirit so evident in this "creative non-fiction". However, several events in Waller's first book, now make better sense after reading the prequel to Glass Castle. Both are interesting examinations of the ability to overcome adversity. Waller acknowledges the strength of the human spirit in a simple, yet unique way. Probably one of the best books I have read in the last year. It is one of those that is hard to put down until you have finished reading it....and then wishing there was more. The author has the gift of making you feel like you are there from beginning to end.